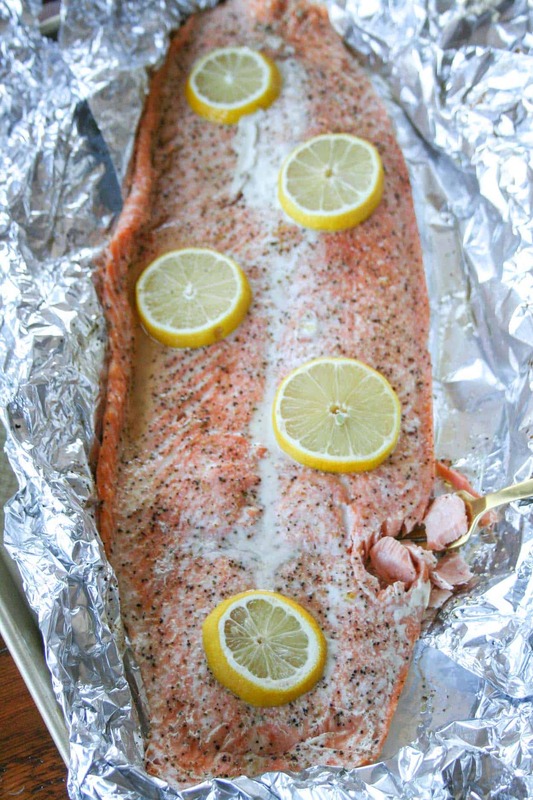 A paleo and Whole30 compliant meal – you only need 3 main ingredients and 30 minutes to make this simple roasted lemon salmon in foil! Happy 2017 everyone! I hope you all had a wonderful time last week celebrating the holidays. Are you ready to tackle the new year?! I know I am! If you saw this post, then you already know that I am on Day 3 of my Whole30 challenge! I am not a believer in restrictive diets. I believe in nourishing your body with whole natural foods and indulging in your sweet tooth. It’s all about balance! So, you’re probably wondering WHY in the world would I do this, right?! Over the past few years, I have been suffering from Raynaud’s Phenomenon. Raynaud’s is an autoimmune condition that affects the circulation in your extremities – mostly fingers and toes – in response to cold or stress. I first started noticing this in college; if I was outside in the cold for extended periods, the blood in my fingers and toes would drain leaving them completely numb and white/yellow in color. At the time it was not bad but over the last five years it’s progressed significantly. Now if the temperature in my office is cold and I am holding a cold water bottle, the circulation to my fingers completely stops. It can happen in a matter of seconds and could take 30+ minutes to fully gain my circulation back. After consulting a few doctors, I was told that there is one medication that can help, but it has nasty side effects. Obviously, I said no to that and decided to just deal with the Raynaud’s. Fast forward to last fall, I was talking with my older sister who has completed the Whole30 twice. She suggested I give it a try in January to see if there is anything in my diet that is causing my symptoms to be so intense. Around this same time, I decided to get tested for Celiac’s disease because my younger sister was diagnosed with Celiac’s a few years ago. I was completely convinced I did not have an issue with gluten and was shocked to find out I have Celiac’s too. Autoimmune diseases are heredity. And they are also linked to one another. My non-doctor brain is convinced that certain dietary choices (like the gluten I have been eating for the past 28 years) are weakening my system because my body cannot process them and causing negative effects on my overall health. I know that was a total brain dump, but that was all to tell you why I am doing this. By ridding my body of sugar, dairy, grains, and legumes for 30 days, I am resetting my system. After the 30 days are complete, I will be able to reintroduce those foods into my diet and see how they affect me. I am hopeful that the Whole30 will help me figure out if certain dietary choices are causing my autoimmune symptoms to flair up. 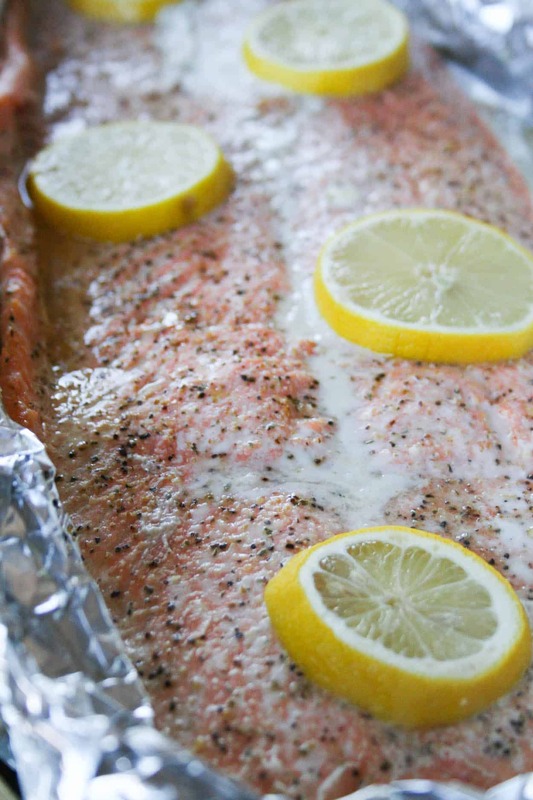 Let’s get to my first Whole30 recipe – simple roasted lemon salmon! I made this over the weekend for lunch and saved the rest to reheat and have throughout the week. I adore salmon. Two of my favorite recipes on this site include cajun salmon tacos and blackened salmon burgers. Both are FAB and can be adapted to be compliant with the Whole30 program. Salmon is beneficial for your health in a variety of ways. Most importantly, salmon is rich in omega-3 fatty acids. Omega-3s help lower inflammation in the body and have been shown to help with chronic diseases. This is so important for people with autoimmune issues. Most commonly, people who have autoimmune issues suffer from a variety of symptoms that are tough to diagnose – one of which is inflammation. Tell me: Have you done a Whole30 before or are you doing one right now? Let’s support each other! 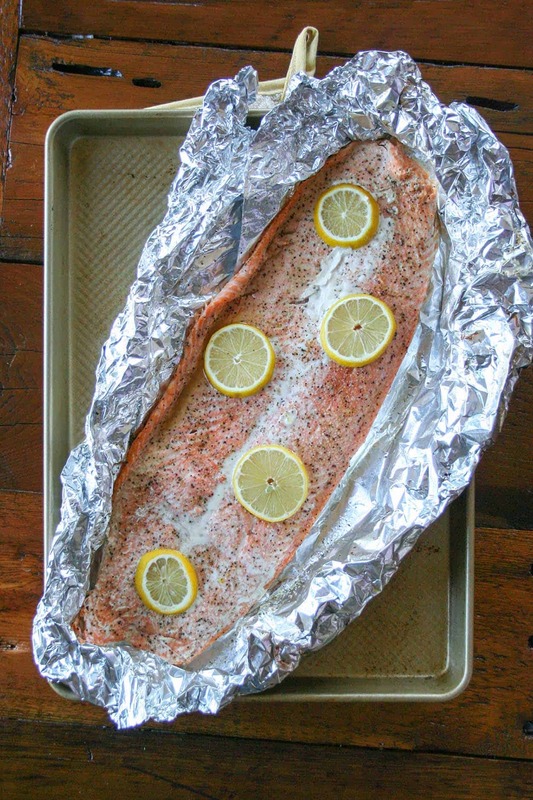 If you make this Simple Roasted Lemon Salmon in Foil or any of my other recipes, post a picture on social media and use the hashtag #imhungrybynature for a chance to be featured! Line a baking sheet with foil and spray with olive oil cooking spray. Place salmon on foil and spray salmon with olive oil cooking spray. Sprinkle salt, pepper, onion powder, garlic powder, and lemon slices on salmon. 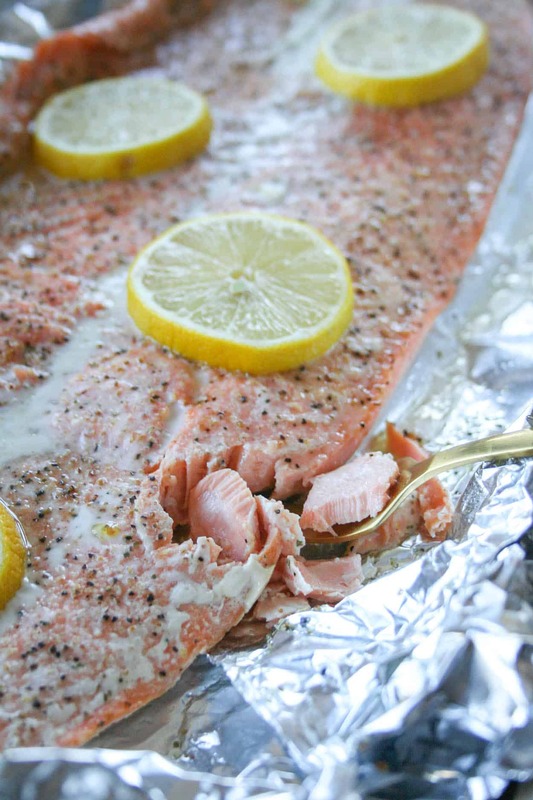 Wrap salmon in foil and bake for 18 to 20 minutes or until salmon flakes easily with a fork. This recipe is written with rough amounts. Increase or decrease the spice quantities to your liking or swap them out for your favorites! Oh, Ellie! I hate that you’ve had to go through this but I’m so glad that you’ve decided to do Whole30. I’m so interested to see what could be triggering some symptoms. It is SO crazy to me how food really can influence how you feel. I’m so happy to have you as my buddy! Thanks Allie – and me too! I’m really hoping that this exercise gives me some clarity into the foods I should be eating. I’m so grateful to you and your friendship and happy we can do this together! 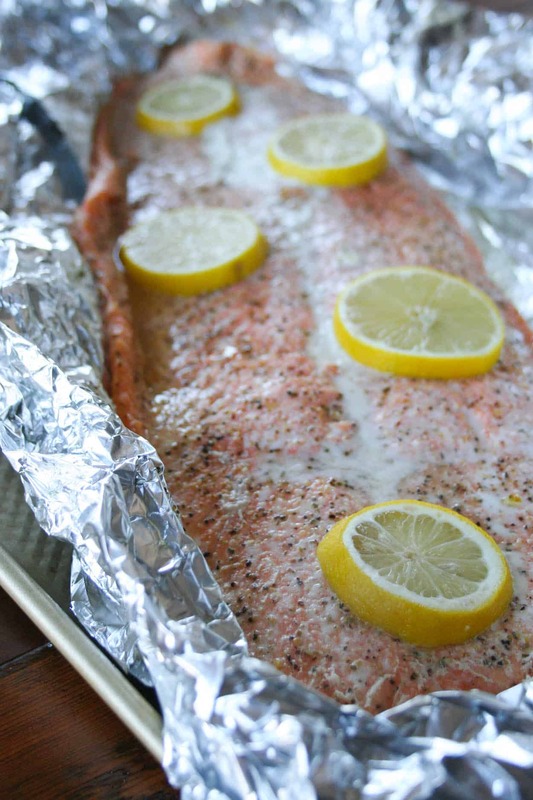 Salmon baked in foil is one of my favorite easy go-to meals! I love to have it with some wild rice and sauteed greens – yum!! This looks super easy to make and delish!! I love salmon! It is! It’s so so easy and the perfect light and fresh meal! Why can’t our bodies just behave themselves? 🙂 I’m sorry you’ve had to deal with all your symptoms, and I really hope Whole30 gives you some insights! So glad we’re in this together, Ellie! Right?! And thanks Ellen – honestly the Raynaud’s has been bad but the Celiacs hasn’t been terrible… and yes, so happy to do this together and hopefully learn something about our digestive systems! Thank you so much Jamie. I am really hoping this gives me some clarity and insight into what is going on! Oh I’ve never tried cooking it in foil before! My family loves salmon. I’ll have to make this for them. Thank you Kate – I hope it helps you too! I’ll be sharing Whole30 recipes all month long, so make sure you check back for more! So easy and delicious – my favorite kind of recipes! We eat salmon a couple times a week. 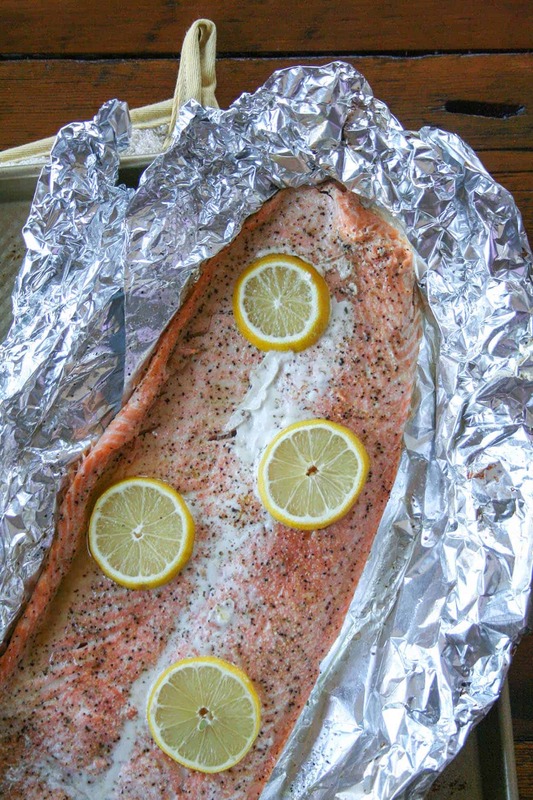 There is nothing better than using foil and seasonings for great flavor and easy cleanup! Love the simplicity of lemon and oil. Exactly Cassandra! So simple, delicious, and fresh – it is my favorite! My daughter suffers from the same thing. Her feet get really cold. We have tried different diet choices for her but she is now 25 and it’s hard at times to convince her to try something. I may have her follow your blog so that she can see how you do with this. I have heard so many great things about the Whole 30. Praying it all goes well for you and you find success. Thanks Mikki. I’m sorry to hear your daughter suffers from this too. I am hoping the Whole30 offers some clarity on whether or not certain dietary choices are affecting my symptoms and I will most certainly be sharing what I find. And I would love it if you share my blog with her! I’ve never tried Whole30 but I’m a vert big believer in the power of food and how it can change your body. I can’t wait to follow your journey! Thank you Allyson – it sounds like we have very similar beliefs on food! I hope that your Whole 30 helps give you answers that you can use to limit or eliminate your current symptoms. I am currently participating in my 3rd round of the Whole 30. My initial rounds were completed with the goal of slaying my “sugar dragon,” and for the most part, they have been successful 🙂 I have eliminated my need for Metformin and have my A1C numbers are in the normal range for the 1st time in 3 years. As a bonus, I lost 38 pounds over the course of my two previous rounds…hoping for that success to continue as well! Good luck with your Whole 30 and Happy New Year! Wow Terry – that is wonderful! There are so many success stories, especially for people with Diabetes, and I am happy to hear that you are one of them! And I am sure that will make a difference. The reintroduction is the part I am really looking forward to – and the part that will hopefully provide me with some answers. Congratulations with all of your success! Please let me know how this round turns out and if you have any special recipe requests in the meantime!! I’m also doing Whole30 right now (also because I was just diagnosed with Raynaud’s and have a sister with Celiacs! Crazy!) . I’m thinking fresh lemon/pepper green beans as one side, but my husband and I always need at least two… any other ideas? We’re getting kind tired of potatoes! That is SO crazy! How is your Raynaud’s? And how are you dealing with it? I’m playing around with the idea of going completely paleo (or following the AIP diet) to see if my symptoms improve. But I would love to hear what you think! For a side, you could do some simple roasted brussels sprouts, or kale sauteed in olive oil (!! ), or if you aren’t sick of sweet potato (I don’t think I will ever be sick of sweet potatoes) you could make my friend Kelly’s tahini whipped sweet potatoes! http://eatthegains.com/tahini-whipped-sweet-potatoes/ I would love to hear how the Whole30 is going for you and if you have any recipe requests – I would be happy to help! I did the Whole Thirty (or should I say 40) and I loved it. I say 40 because the reintroduction phase adds about 10 days. I found it very easy to follow, and lost 14 lb. Even though it’s not a weight loss diet, one tends to lose weight on it. I’m actually kind of still following it, though eat a bit of dairy and grains. Basically it taught me to eat “clean”. No preservatives and a lot of label reading! The only think I’ve seemed to have a problem with digesting after the Whole 30 was Quinoa! I will try again, as it is so good for you; it could just have been that my system wasn’t used to eating so much fiber after the Whole 30. I highly recommend eating this way! I’m happy to hear you had such a great experience with the Whole30! Even though I do not follow the diet completely, it totally changed the way I look at food and how I fuel my body! I’ve made your banana bread, with a few additions. I reduced the sugar to 1/3 cup & added walnuts, raisins& those mini dark chocolate peanut butter cups from Trader Joe’s; on other occasion, I exchanged them for small pieces of dried figs. It came out sooo beautiful & delicious 😋!!! The structure for the cake I copied from the “Banana Bread Mixture “, also from T J. Thank you 😊 a lot!!! Yayayayy that is so wonderful – and you are welcome! I too suffer from Raynaud’s Phenomenon and it has progressively gotten worse with age. Now in my early 50’s and simply feel unwell 80% of the time. My husband and I committed to doing the Whole30 starting November 1st and I am doing my research and menu planning to prep when I came upon this recipe and your “brain dump” – I stopped dead when I read this. It never occurred to me that my Raynaud’s was related to my diet. It will be interesting to see how I feel in a month! I am so sorry to hear that you suffer from it too – it is the absolute worst. Hopefully the Whole30 helps you feel better! To be honest, the Whole30 made me feel incredible but didn’t do much for my Raynaud’s at all. Hopefully it will do wonders for you! Please keep me posted and let me know if there are any Whole30 recipes you would like to see! I admit I was skeptical at first…but I needed a quick and easy recipe for already defrosted salmon and I didn’t have any fresh herbs sitting around (a requirement for so many other “easy” Whole30 salmon recipes). This was AMAZINGLY delicious. I doubled the amounts of the spices and it was still an elegant dish. Thank you! oh my gosh, THANK YOU for sharing Jyoki! I am all about simple recipes made with ingredients you have on hand and I am so glad you love this as much as I do!